Lately, I have been getting a lot of people asking me about where to find a condo with some space without breaking the bank. Developers in Toronto are making more condos that are smaller than ever before in a city that already makes small condos. So, where do you find a condo unit with space in this in this current market? Traditionally, I would point to older condos back in the day when condos where made larger, albeit with dated appliances and finishes by now. Older condos can have some pretty big condo fees, though, because of all the amenities they have and because things break down and need to be fixed after you've been around awhile. These condos are really not that close to High Park. They are in the Junction though. And though I often do not endorse giant condos, this eco-friendly building offers up some condos , 2 bedroom plus den, with over 1000 sq ft and still under 400K. Not bad at all despite the so-so finishes on many of these units. Plus, the Junction is just getting better and better - a cool, hip strip right at your door step. 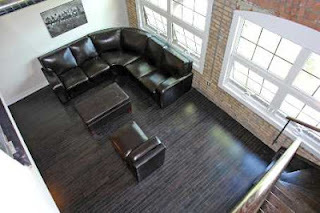 These converted lofts at Lansdowne and Davenport are less expensive than their other converted loft counterparts. Thus, more space is available at a lower price. Lansdowne and Davenport isn't exactly the most exciting area of town, and some of the social housing to the south can look a little grim, but with another huge condo and a Dominion going in at Dupont and Landwone, this area has a bright future. Now these south Etobicoke lofts are huge, and right off the Gardiner, if you drive. The maintenance fees are kinda high, but most of the units I've seen are amazing. Over 1100 square feet for under 350K. Plus beautifully done units with huge ceilings and lots of windows. This isn't a definitely list. There area great condos to the east with some space too! These are just my current faves for the space-lover in us all.